Spaghetti. Is there a meal that is more likely to be agreed upon by all members of the family than this? Whether they call it "spaghetti" or "pasketti", everyone seems to like it. Except the pesky husbands. Something about "not enough meat." 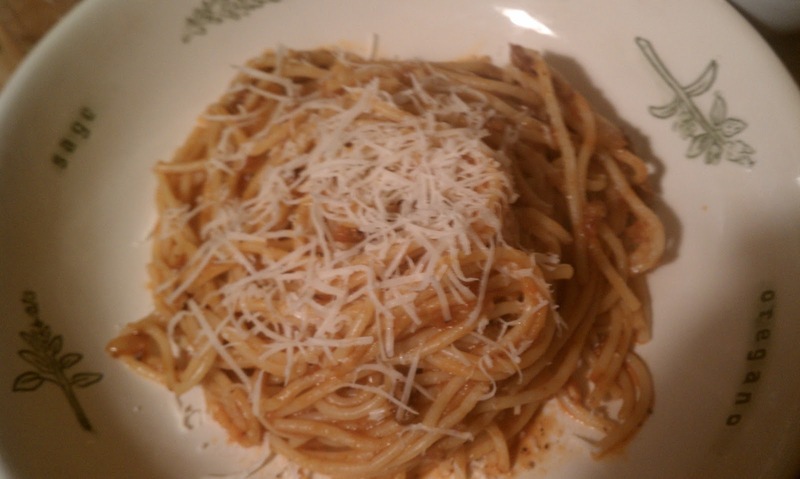 I have several versions of spaghetti, and they are all good. It just depends on how much time I have, what mood I am in, what ingredients I have on hand, and how much money I want to spend on dinner. My very favorite spaghetti, in fact, my very favorite meal, is spaghetti caprese (kuh-pray-zay). It is a pleasure to both cook and eat. I start with fresh tomatoes, peel, seed, and chop them, and make them into a quick sauce with lots of garlic, olive oil, red pepper flakes and fresh basil. Finally, I add some chunks of fresh mozzarella cheese and toss it all together. It's so good. And so time-consuming. Better to save for weekends. Of course, you've heard of the all-day spaghetti sauce. 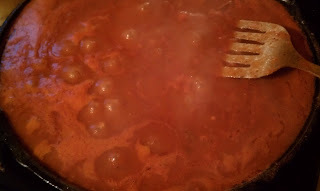 The one that starts with whole tomatoes and a bunch of other ingredients, and simmers for hours on the stovetop. Italian grandmas are famous for it. It's often kind of chunky. Not my favorite (I absolutely hated cooked tomatoes as a kid, and though I now love them, I can't quite get over the idea that chunks of tomatoes simply don't belong in a spaghetti sauce), but it's a fun process and sometimes worth it, especially if I have the time to make some meatballs to simmer along with the sauce. But still so time-consuming. It's a common misconception that people who love to cook and stay away from convenience foods, spend hours cooking each meal. Not true. I wish! Alas, there is still laundry, dusting, decluttering, and taxi-ing to be done. The sad fact is, unless I have the forethought and time to cook in the morning or early afternoon, I need to cook quick meals just as much as the ladies who work outside the home. Our kids go to a charter school about 15 minutes from our house, so there is no bussing. I have to pick them up each afternoon, and by the time we get home, it is at least 4:00, or later if there were errands to run. Then it's time to get the kids on-task. There are chores to be done, homework to be finished, music to be practiced, and arguments to be broken up. Burying myself in the kitchen to make a gourmet dinner simply isn't an option most of the time. And even if I had the time, I still don't have the money. So some meals are better than others for weeknights. My weeknight spaghetti has a meat sauce (a little more husband-friendly) that is quick, easy, and cheap to throw together. You can pretty much put the big pot of water on to boil before even starting the sauce. By the time the water boils and the pasta cooks, the sauce will be ready. So let's get started. First, put a big pot of water on the stove. It will take a while to boil, and you can start the sauce while you wait. You might also want to preheat the oven to 425 degrees. Start by chopping an onion. It seems like I start a lot of recipes this way. Almost all of them. But then, Ina Garten jokes that most of hers start with a stick of butter, so I guess that's okay. A medium dice will be just fine for this sauce. 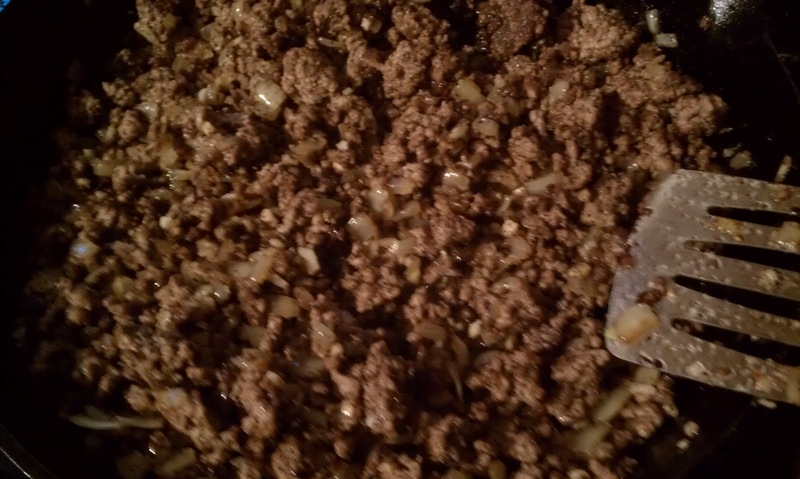 Now mince some garlic. I like about 3 cloves, but you can start with less and add more next time if you want bigger flavor. That's it! That's all the chopping it takes! This makes me happy. Now we need to brown some hamburger. Whatever you want to use is fine, but I use ground chuck almost all of the time. 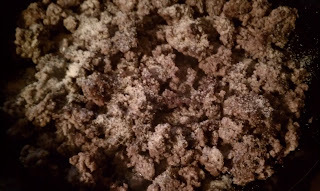 Ground sirloin only if I found a really good sale. I stay away from ground round. 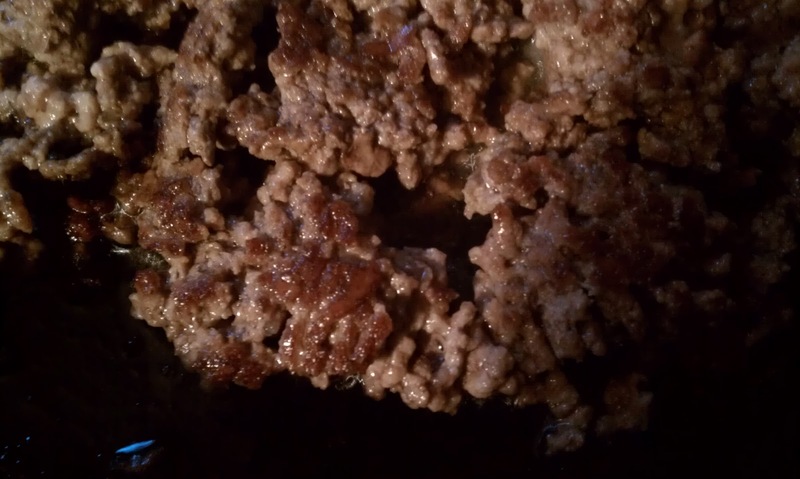 Browning hamburger is something that pretty much everyone has done, right? But are you getting all the flavor out of your hamburger that you can? 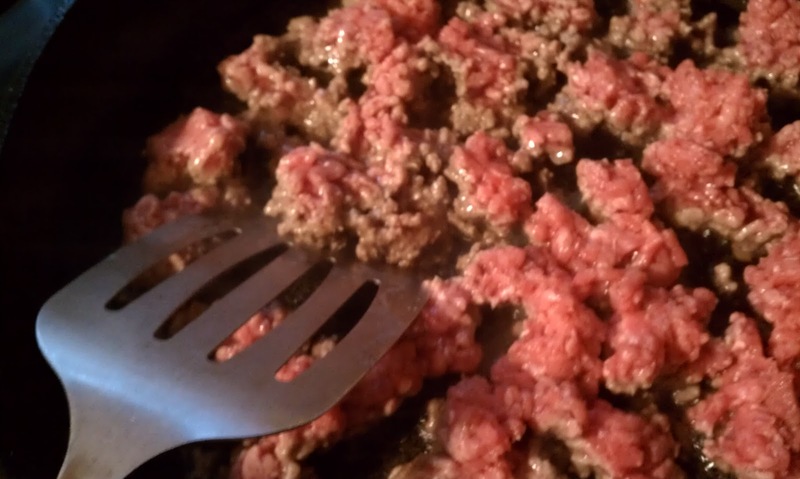 Did you know that you can caramelize hamburger to add more flavor to your sauce? You may have heard of pan searing. It's usually done to larger pieces of meat, like steaks or roasts. It sears the outside of the meat, sealing in the juices for the rest of the cooking process, while also leaving behind browned bits (fond) in the pan. 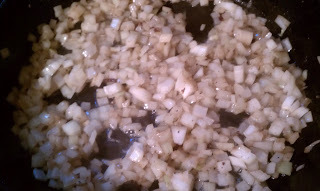 Those browned bits are full of flavor and can then be used to flavor a sauce. 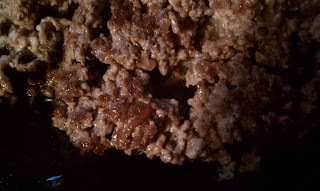 Well, ground meat can be "seared" as well. The same basic steps apply. 1. Get your pan really hot, then add a bit of canola oil. Don't use teflon here. Stainless, anodized, or cast iron work well. 2. Slap your meat right into the hot pan. If you don't hear a hard sizzle, the pan isn't hot enough. 3. Don't crowd the pan too much. 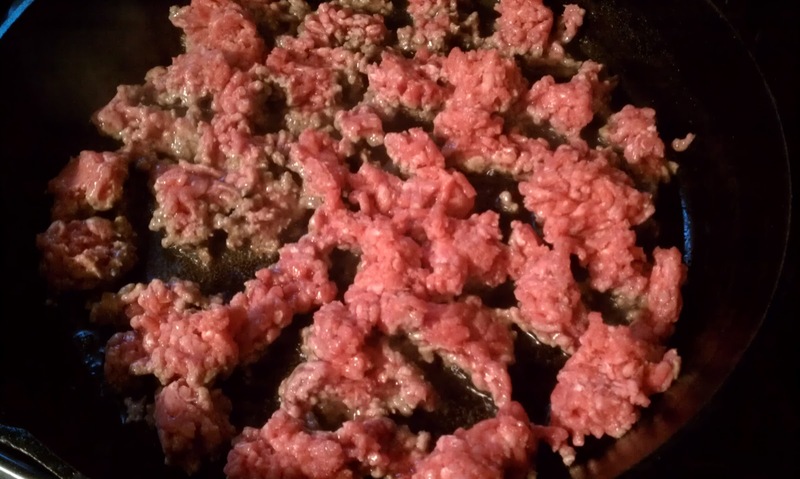 This is easier with ground meat, but still be mindful. If there is too much meat in the pan, it will steam instead of sear. 4. Step away from the pan. You have to let the meat get a good brown layer on it. That's where the flavor comes from. Don't stir the meat! 5. Once you see some brown around the edges, check to see if the meat has released from the pan by nudging a spatula under a piece of meat. If the meat is still sticking, then it hasn't seared, and it isn't ready to turn. It really will release like magic once it is set. So be patient. There! See that? See how it's really dark brown, not beige? Well, you would see that better if I knew anything about taking decent pictures, but trust me. 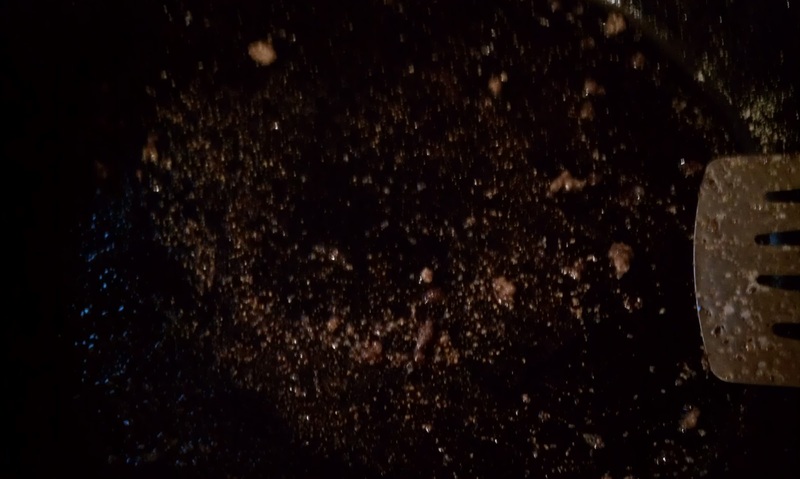 You want to see some really brown-brown. You will also see some brown on the skillet....unless you are like me and use cast iron. It's not quite so obvious on black. But I like using cast iron, especially with tomato sauces, because the acidity causes some of the iron to leach into the sauce. I can use all the iron I can get. Now you can season your meat. Don't be shy. You'll need at least a teaspoon of coarse salt (less if you are using table salt), plus lots of pepper and garlic powder (not garlic salt). 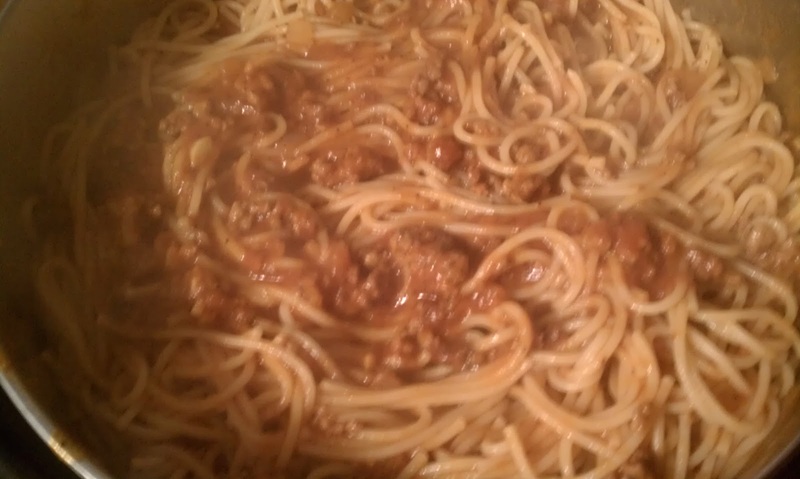 If I was making a normal batch of spaghetti, I would just push the meat to the cooler side of the pan at this point. But I made a double batch of sauce, so there wasn't enough room. I just scooped out the browned meat to a bowl and set it aside. Now it's a little easier to see the bits of flavor that the meat left behind. That's going to make the sauce taste better. Now, just add a little bit of olive oil (the heat won't be quite as high as when you browned the meat, so a lower smoke-point oil is okay, and we want the flavor of the olive oil in the sauce) to the still hot pan, and add the onion that you diced earlier. Stir it around to coat with the oil, while also scraping the pan to loosen the browned bits. You will see the onion begin to take on a golden color almost immediately. Turn the heat down just a little and let the onions soften. Once the onion is soft and a bit translucent, clear a small space in the pan. 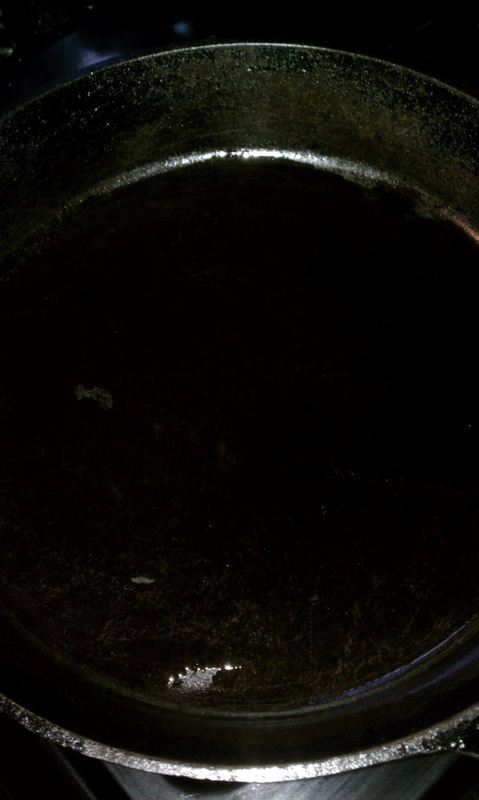 If the pan seems dry (more likely with cast iron), add just a small drop of olive oil. Then add the minced garlic and a dash or two of red pepper flakes (if you like a little heat). Stir these around gently, just to moisten in the oil and keep them from sticking. In about 20-30 seconds, you'll smell the glorious aroma of garlic and olive oil. 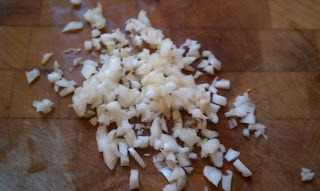 Immediately stir the garlic and onions together to keep the garlic from browning. Then add the meat back into the pan and stir it all together. 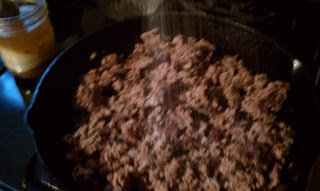 That's how I brown ground beef. All the time. 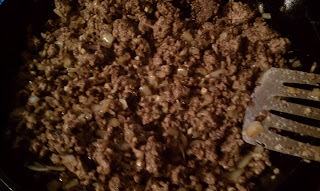 It doesn't matter what the ultimate dish is--tacos, stroganoff, casseroles--I always use salt, pepper and garlic powder, and add in sauteed onions and garlic. Even if the recipe I am using doesn't call for it, I brown hamburger this way. I can make adjustments to the rest of the seasonings later, but in my opinion, the meat has to be well-browned and well-seasoned first. 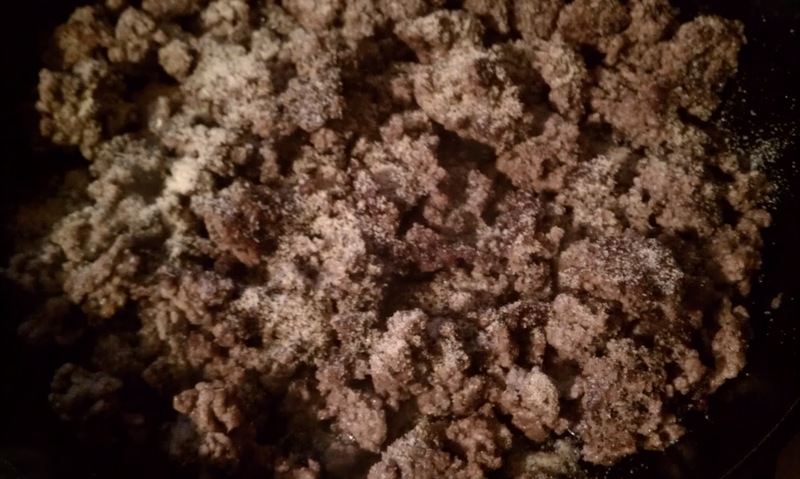 One exception: If you are adding any sort of packaged seasoning, check the salt content. Taco seasoning isn't a problem, but many others are packed with sodium and will make your meal too salty. Now it's time to make the sauce. This is really, really complicated, and it requires some specialty equipment. Namely, a can opener. Yup, open some cans. You'll need a 15 ounce can of tomato sauce (strongly recommend Hunt's) and a 6 ounce can of tomato paste. Don't confuse the tomato sauce with spaghetti sauce. Jarred or canned spaghetti sauce has lots of stuff added to the tomatoes. It's usually heavily seasoned with herbs like oregano, basil and parsley. And it's almost alway chunky. I can't say that I have ever had a jarred spaghetti sauce that I liked much. Tomato sauce, on the other hand, is a smooth, cooked-down version of pureed tomatoes. 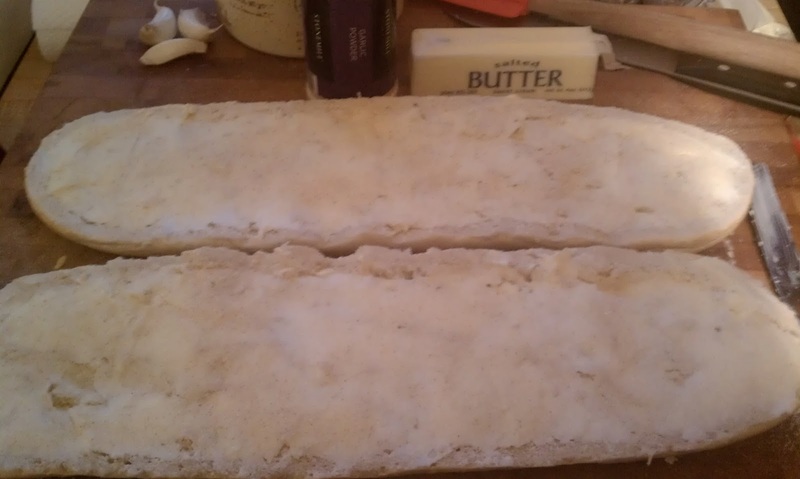 There is a little sugar and oregano added, but neither is really noticeable. They just seem to smooth out the acidity of the tomatoes. Tomato paste is basically sauce that has been cooked down even further. It adds a deep tomato flavor, and serves to thicken the sauce. You don't want it too thick, though. And because the tomato sauce and paste were cooked down so much, you'll want to add back some water. That may seem counter-intuitive. Why not just use pureed tomatoes? 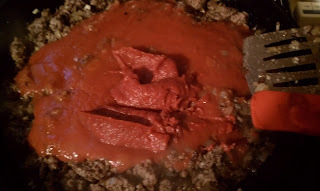 Well, because the sauce and paste add the long-cooked flavor without having to cook them all day, and because, as I said, the sauce has been smoothed out and won't taste as harsh and acidic as tomato puree will taste straight out of the can. If I was making the all-day-simmer spaghetti sauce, I would use tomato puree. But Hunt's does some of the work for me, so I don't have to. So fill both of the cans about 3/4 of the way with water, swishing a little to get the remains of the sauce loose from the can. Pour them both into the meat and sauce, and stir. Bring the mixture to a simmer, and then turn the heat down to low until the pasta is ready. By now, your water should be rapidly boiling. 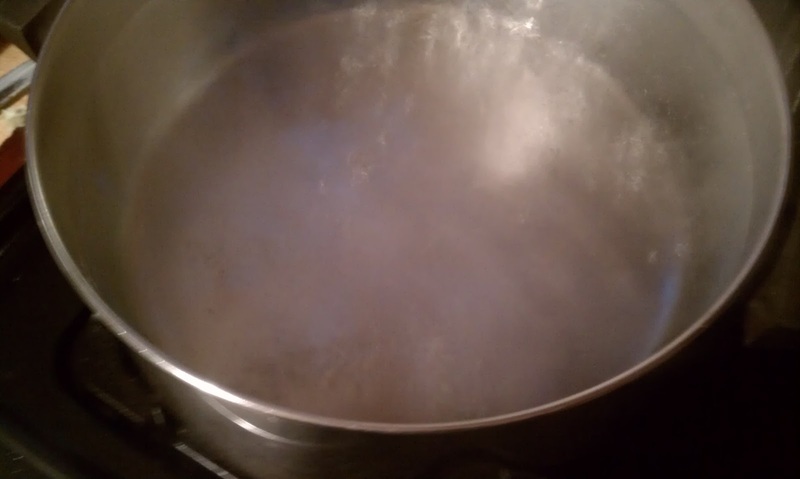 It's surprisingly hard to capture rapidly boiling water in a picture. At least with a phone, it is. Make sure you heavily salt the water. A sprinkle won't do anything for the flavor of your pasta. A tablespoon will do lots. A fistful will do more. And no, it won't taste overly salty. 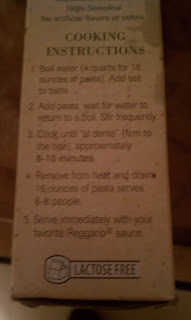 Also, this only helps before you add the pasta, or right after. 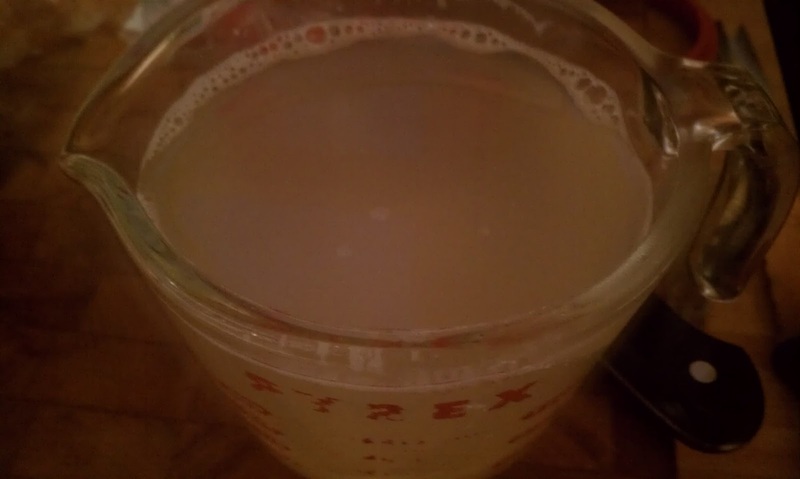 The pasta soaks up the water, so if the salt isn't dissolved in the water, it can't be absorbed into the pasta. Now add a pound of pasta. I'm terrible at guessing how much a pound is. Every once in a while, I get pasta from Meijer on a good sale, and it makes my life so much easier, because it's in 1 lb boxes. Most of the time, though, I buy it at Aldi, where it comes in 2 lb boxes. It doesn't seem like that should be so hard....just use half, right? Only I never guess right. Fortunately, that can be dealt with later. I break my spaghetti in half, too. You don't have to, of course. I just find that it is easier to both cook and eat. 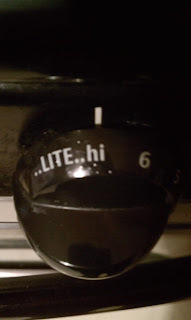 I don't want to haul out the stock pot to cook spaghetti in, nor use the amount of gas necessary to heat all that water. But my six quart pot isn't big enough to immerse whole spaghetti in. Besides that, getting whole strands of spaghetti from plate to mouth can be a messy affair, especially for kids. 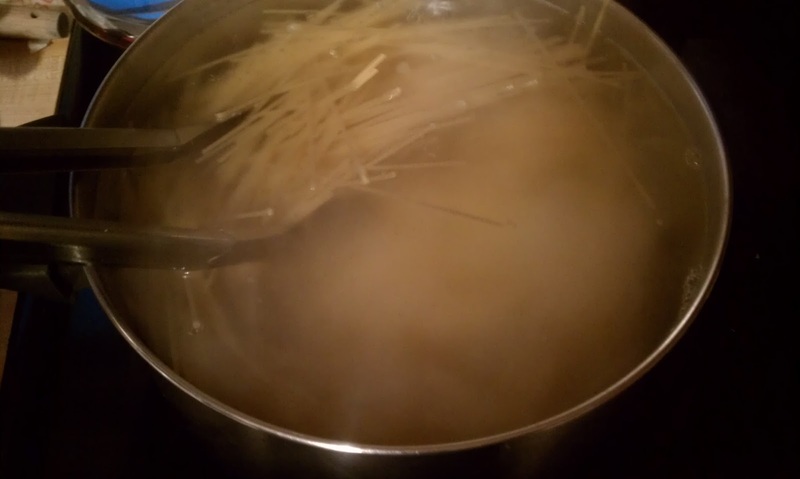 Breaking handfuls of spaghetti in half before dropping into the boiling water solves both problems. Once the pasta is in, give it a good stir. I like to use tongs for this, because I can both stir and squeeze at the same time. Squeezing helps to break up clumps. 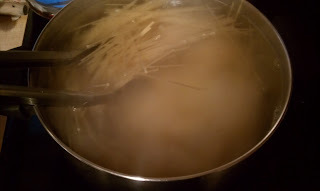 Clumps of pasta (formed when the starch in the pasta gets wet and acts like glue unless broken up and encouraged to dissolve into the water) can ruin my day. You'll want to give an enthusiastic stir right away, and every couple of minutes after that. While the pasta cooks, you can get some garlic bread ready. Use an Italian loaf from the grocery bakery--or homemade if you were really motivated earlier in the day. 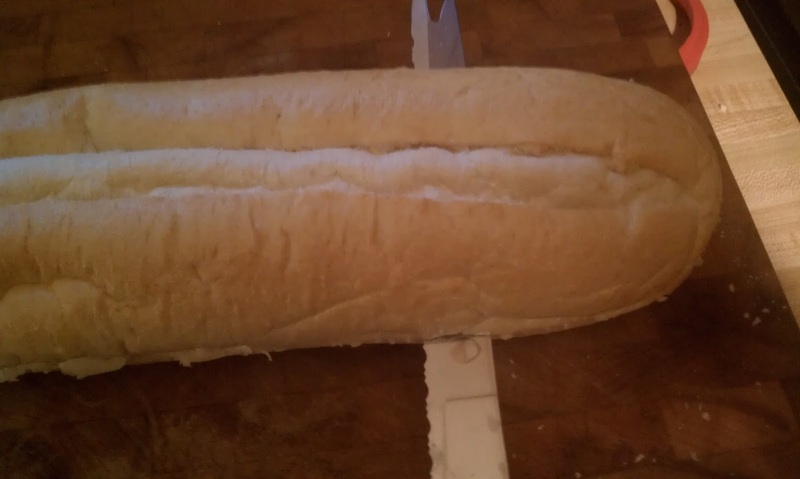 Slice it in half, as evenly as you can, as though making a huge sandwich. 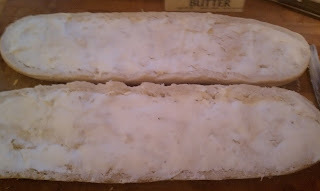 Open it up and spread it with softened butter. I beg you, don't use margarine. Margarine is gross. Use butter. Then sprinkle it with garlic powder. Again, if you want it to be really good, and you had time, you can use garlic oil instead of butter, smooshing the softened garlic into the oil. Or, use the softened garlic, but save the oil for another use (keep garlic oil in the fridge), and just smoosh the garlic into butter. Vastly better, but also more time-consuming. And since this is about weeknight spaghetti, we can be content with garlic powder. 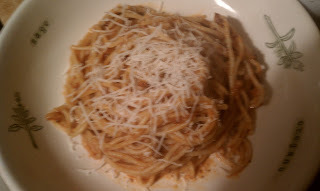 You can also sprinkle on some parmesan cheese if you like, or even shredded mozzarella. But I didn't. This time. 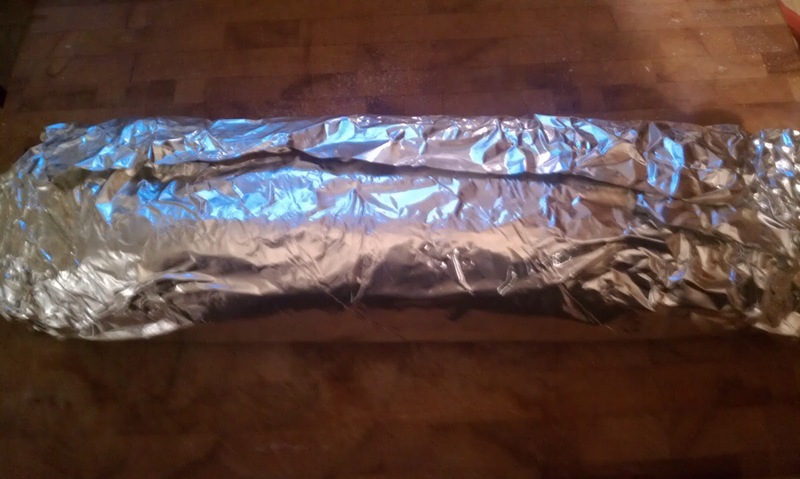 and then fold the sides up and over the bread. This will ensure that no melting butter will leak out of the foil wrapping and smoke in your oven. Now just place the loaf into your preheated oven for about 15 minutes. It should just about be done by the time the spaghetti and salad are ready. Cooking pasta "al dente" is easy. It mainly involves following the directions on the box. Once the water is boiling again, set the timer for the minimum time listed on the box. When the timer is almost ready to go off, use your tongs to fish out a piece of pasta, and bite into it. "Al dente" means, literally, "to the tooth." Basically, it means that you want just a little resistance to your bite. If your teeth go through it like a hot knife through warm butter, your pasta is overcooked. If you still feel like it's almost crunchy at the center, you might want to let it cook another minute or so. 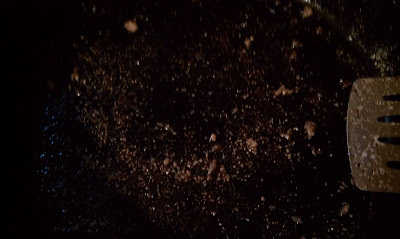 However, I like to drain it just at this point--a little underdone. If it's not quite done, that means that it can still soak up some moisture without becoming soggy. I want it to soak up some sauce, so I drain it a little early. First, though, I scoop out a cup of the pasta cooking water. 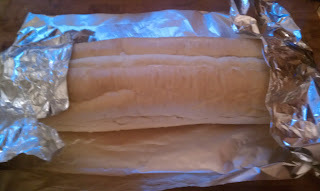 It is full of starch and seasoned with salt. So if I find that I don't have quite enough sauce, or my sauce has thickened too much, I can add a little of this starchy water to loosen the sauce without thinning it too much. Once the pasta has drained (don't rinse it! you need the starch on the pasta to help the sauce cling to it! 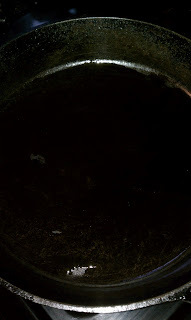 ), place it back in the pot, or straight into the pan of sauce, if there is room. Again, I made a double batch of sauce, so I put the pasta into the pot and ladled the sauce over the top. Stir it together, and add a little pasta water if necessary. 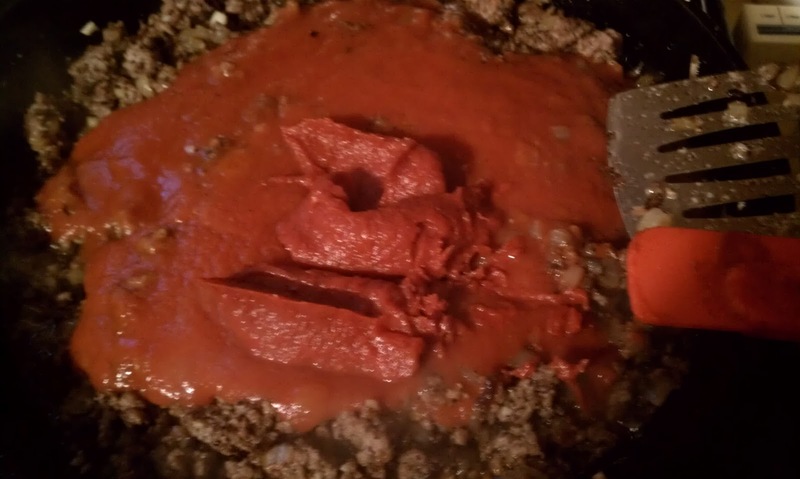 You want the sauce to be a bit loose, since some of it is still going to be sucked up by the pasta. Dry spaghetti is bad. Now cover the pot and let the spaghetti sit while you make a salad. Sigh. I know the color is awful in this picture. I had lost all daylight (it is November in Michigan, after all), and had to rely on the overhead kitchen light, which washes all the color out. The sauce really is red.